A day late and a dollar short, we celebrated Independence Day yesterday (July 5). 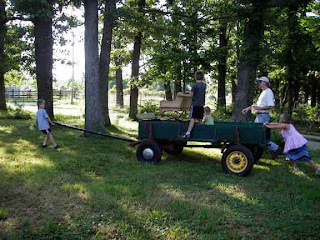 We went to the Pugh-Towe farm in Granby where we were served a wonderful cowboy dinner. Pork chops, fried taters, corn on the cob, fresh veggies, barbecued beans, biscuits, blueberry cobbler and apple something-or-other, all of which was yum. Our hosts’ parents cooked it all over the campfire in cast iron. That’s the best way if you ask me. 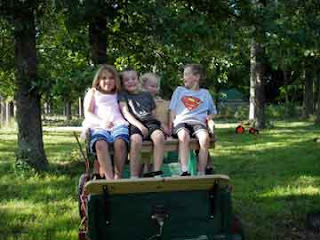 The kids entertained themselves on the wagon. The grownups were sitting round the big tree jib-jabbing away when I see the wagon go by in the background. Those kids pushed that wagon around the house by themselves. They played Little House on the Prairie for hours, ate dinner, then went back to it for another few hours. Where Do Eggs Come From, Exactly?